I have been meaning to write this post for a while as I would like to start a surreptitious campaign to bring fideos to the UK. Fideos can be defined as extremely short and thin spaghetti (well, the ones I like are thin). You can make lovely soups with them and one hugely popular soup is the Spanish recipe this post is for: sopa de fideos (pasta soup). This is a really simple recipe, in fact if you have good homemade chicken or vegetable stock at home you can just add the fideos and, within five minutes, you could be ready to sit down to steaming hot comforting soup, spoon in hand. My mother always has stock in the fridge or in the freezer precisely for this purpose. It should always be cooked the moment you want to eat, that’s when it tastes best and it takes so little time to prepare that it is totally feasible. This is the soup you eat when you’re cold and need warming up, when you don’t feel so well, when you need cheering up… Ok, by you I mean me but let me tell you, that cup of tea that the British fix everything with…this is my Spanish-style cup of tea. 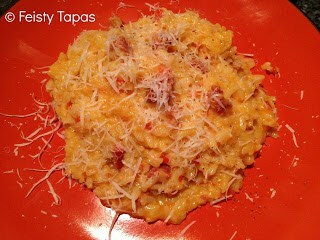 And, yes, being me it includes chorizo (you didn’t expect anything else, did you?). your taste (don’t panic, it’s easy to do). Fideos are designed for soups so they get soak in the stock in a delicious way. If you’re vegetarian, ditch the chorizo, use your favourite stock and you’re sorted. I promise you it will still be lovely. Fideos are not easy to find in the UK. In Tesco you can find Lubella Filini no. 2 (a Polish brand), but they’re number 2 (hence much thicker and they don’t soak in the lovely flavours like my absolute favourite: Gallo no. 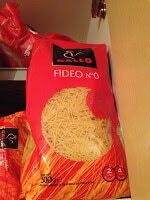 0 (it has to be, it’s the only fideo brand I’ve been able to find in the UK, there are other brands in Spain of course). You can find the Gallo brand in the Spanish London supermarket R Garcia and Sons (you can order online or pop in for a visit). I’m pretty sure my husband has bought them from the La Plaza Deli in Portobello too. Of course, try any local Spanish shops or market stalls you may pass on your travels and, should you see a Portuguese shop, ask for their pasta soup range, even if they don’t have fideos, you will find tiny pasta dots, stars or teardrops that tend to be really good and work rather well. Substitutes: De Cecco Stellette nº75 (I’ve seen them in Waitrose), Orzo pasta (I get it from Waitrose and I have seen it in selected Tescos), Tesco’s Farfalline, Lubella’s Filini. You could also break vermicelli into short length cut-at-home fideos. 1 litre of stock or however much you fancy having (I have to warn you that it is addictive so you will be going back for more). 1 chicken stock cube if using water (I use Kallo), depending on the amount of water you may need more or less stock. 250 g approx of fideos or substitute pasta (how I calculate is by checking the resistance of the pasta against the wooden spoon when stirring straight after adding them, if there’s a bit of resistance, that’s about right, if it stirs too easily, it needs more). 1 carrot (quartered lengthways and then sliced not too finely and not too thickly so that it cooks quickly). 25-50 g chorizo, peeled and “pierced” a couple of times with a fork (I tend to use either half a sausage or a whole one) peeled and (as you may know from previous posts I tend to use Tesco’s Cooking Chorizo nowadays, I should tell them that, shouldn’t I? That failing, get the Revilla’s Chorizo de Pueblo. If you’re really lucky ask your local Spanish shop/stockist/market stall). Place the water in a medium pan, when it’s boiling add the chicken stock and carrots. Let it bubble away. After a couple of minutes add the chorizo. 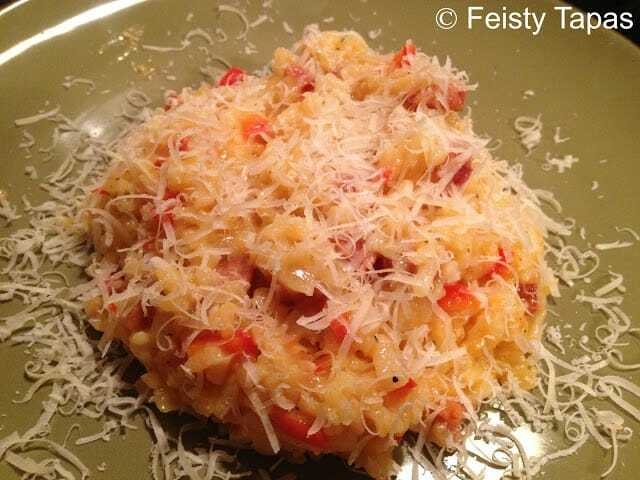 When the carrots start feeling tender (it will only take a few minutes), add the fideos or pasta soup. Follow the pack instructions. If using number 0 fideos, try not to let them overcook, they are best al dente. Make sure you stir once in a while. 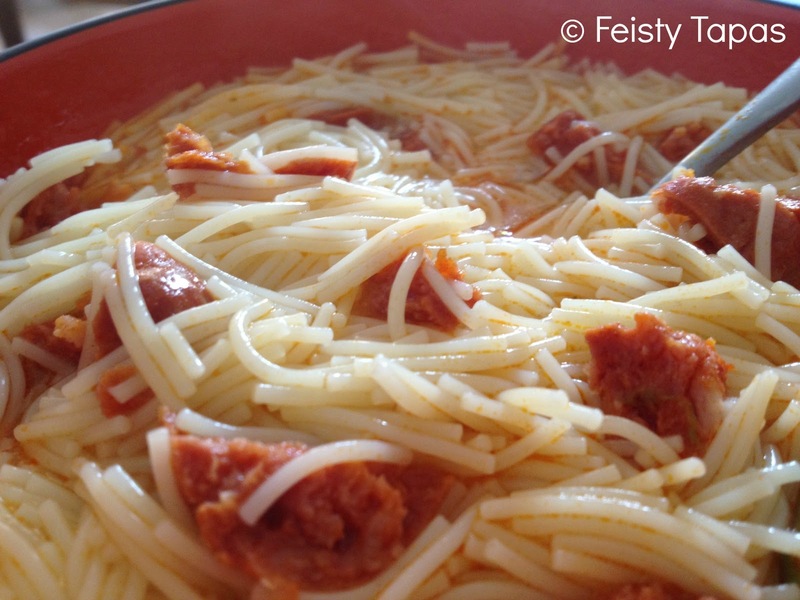 If using fideos remove the chorizo and, with the help of a fork and a knife so not to burn your fingers, chop it (you know my method, cut lengthways first and then slice away) before you put them in, if using pasta that takes a bit longer to cook, you can leave the chorizo a bit longer. HINT: Should it be too thick, add more stock. Should it be too watery, just make sure you make it thicker when serving it by removing some of the extra liquid. See? I told you it was easy. If you don’t eat it all straight away, make sure you remove it from the heat and leave the lid either off or only half covering the pan so that the pasta doesn’t go too soft. TIP: When immediate comfort is required, skip the carrots, add the chorizo and stock cube (if not using your own stock) when the water starts to boil and add the fideos or similar pasta for soup. In 5-10 minutes, depending on the type of pasta you could have a fantastic warming and comforting soup. EXTRA TIP: You can also make a sopicaldo by chopping any leftover chicken and vegetables you may have. YET ANOTHER TIP: Try making it with quinoa for a gluten free version, in that case make sure the chorizo is gluten free too (many tend to be but I am of the “you never know” persuasion). If you’re new to my blog, welcome! You can find out more about in my bio. 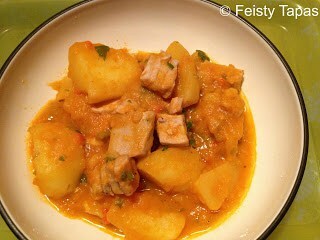 As most of you lovely regular readers know, I grew up in Northern Spain, Marmitako is not typical of my region (Galicia) but, if you move your finger a little bit to the East along the Northern coast of Spain you will find Cantabria and the Basque Country, where Marmitako (Spanish tuna casserole) is the perfect homemade hearty food. It actually is more typical of the summer when the fish used (bonito) is in season. But it’s a hot hearty dish so it will warm your cockles in the winter (I wonder what the tuna will think of me talking about cockles!). My mother used to cook Marmitako quite a bit growing up. You see, unlike me, she had cookery lessons in school and outside (this was Franco time) and, as she was supposed to be a proper lady, I remember her attending courses and the multitude of notes and books she brought back with her. I have recently asked her for some, will she let me have them? We shall see. I have been cooking Marmitako the conventional way for a few years, actually not that conventional as I started cooking it when I lived on my own and I just did quite a quick version. This is the Thermomix conversion, with the help of the Marmitako recipe in the Spanish Imprescindible book that comes with Thermie as standard in Spain. 760 g floury potatoes. Cut the potatoes with a knife but don’t cut them fully with it, cut them about half way and the rest you snap with your hands, this helps them absorb better and the starch works for a better sauce. My potatoes weren’t very big so I quartered them, made a deep cross with the knife on them and snapped the rest. This is called “chascar patatas” in Spanish. Thermomix TM 31, chopping board for vegetables, chopping board for fish, a couple of knives. I also used a bowl full of fresh water for the potatoes, I like placing them in water for a bit as I peel them. Place the pepper, onion, tomato, garlic and oil in the bowl: 3 seconds, speed 5. Spatula in hand, make sure you slide down anything that has climbed to the sides: 7 minutes, Varoma, speed 1. Add the paprika: 3 seconds, speed 3. Put the butterfly in place and add the potatoes: 2 minutes, 100ºC, reverse, spoon speed. Add the water and salt: 24 minutes (adapt this to your potatoes, I started with 20 but needed a further 4 minutes), Varoma, reverse, spoon. 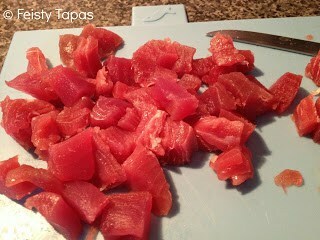 Add the tuna and a couple of twists of the pepper mill: 3 minutes, Varoma, reverse, spoon speed. Lift the measuring cup to add the herbs a bit at a time during these 3 minutes. When the Thermomix finishes doing its job, don’t touch anything, just leave it to rest for 5-10 minutes (depending on how much patience you have). TIP: Add a bit of white wine about 3 minutes into step 2. Thermomix or are giving some serious thought to buying one, I run the fantastic Thermomix Owners UK Facebook group. Ever since I got the Thermomix this summer I have been keen to adapt this Chorizo and red pepper risotto recipe so that I don’t have to keep remembering to add water to the rice as it cooks (I can be a bit forgetful and end up setting alarms on my phone to alert me every few minutes, although I sometimes even forget to do that). With a toddler and a risotto in the house I also cook in fear that LittleT may wake up and the whole thing may end up rather burnt. I finally dared to try it in the Thermomix a couple of days ago and it turned out rather well. I think a good risotto will always have to be made with love, time and a ladle over the hob but this is a very close hands-free option! If you would like to give the conventional method (pan, ladle and hob), you will find my recipe here. 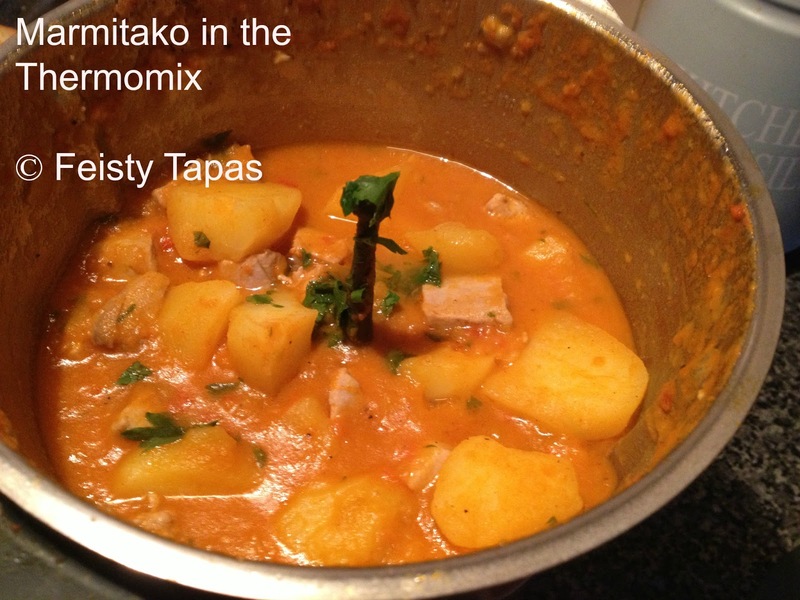 Anyone more experienced than me at making risottos in the Thermomix is most welcome to give any feedback. I did a lot of research before daring to take the plunge and did warn husband, as I sat down to enjoy my 17 minutes on the sofa, that there was always the possibility that we would end up ordering pizza. I was actually surprised that it turned out well. 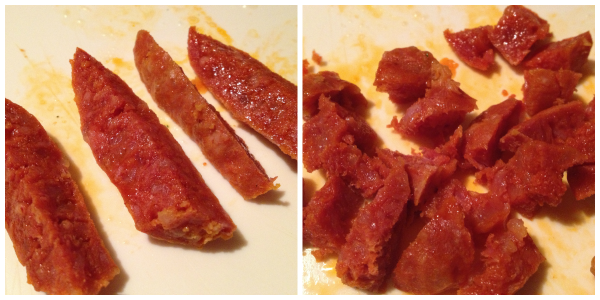 100 g chorizo, skin removed (for those of you in the UK, I use 2 sausages of Tesco’s cooking chorizo). I quarter it lengthways first and then slice it, it makes the most of the chorizo, reducing how much of it you have to use and giving the dish lots of flavour. Thriftier and healthier in one go. I tried once chopping it in the Thermomix and it didn’t work so I recommend cubing it by hand. Chicken stock cube (I use Kallo). This is if you’re not using your own homemade stock. Handful of fresh parsley or coriander or a teaspoon of dried mixed herbs (optional, don’t worry if you realise at the last minute that you haven’t got any at home). If using fresh herbs you can chop them in the Thermomix at the start. Parmesan (I tend to just grate it over the plates once I’ve dished out but you could grate it in the Thermomix before starting). Thermomix TM 31, chopping board for vegetables, chopping board for meat. I think that’s it. Chop the onion 5 seconds at speed 5. Add the pepper and garlic and chop 2 seconds at speed 5. Add the oil, sautée: Varoma (120ºC for TM5), 5 minutes, speed 1. Add the chorizo: Varoma (120ºC for TM5, 2 minutes, speed 1 (if your chorizo is quite crumbly do this on reverse). Add the rice: Varoma (120ºC for TM5), 1 minute, speed 2 (keep it on reverse if you used reverse in step 2). Add the water and the chicken stock cube (no need to add salt, the chorizo and stock provide enough): Varoma (120ºC for TM5), 18 minutes, reverse, spoon speed. I didn’t use herbs this time but I would add them in the last minute of cooking along with some salt and pepper but this time I didn’t use any salt at all and just twisted the pepper mill after I had dished up. I tend to add the parmesan once it’s on the plate (we all like different amounts of cheese at home anyway), apparently the authentic way of doing it is by adding the cheese at the end and letting it rest for a while… but just think of the washing up! TIP: Some of my readers like to add a bowl with a few fresh spinach leaves, pour the risotto over them once it’s cooked and mix them in. 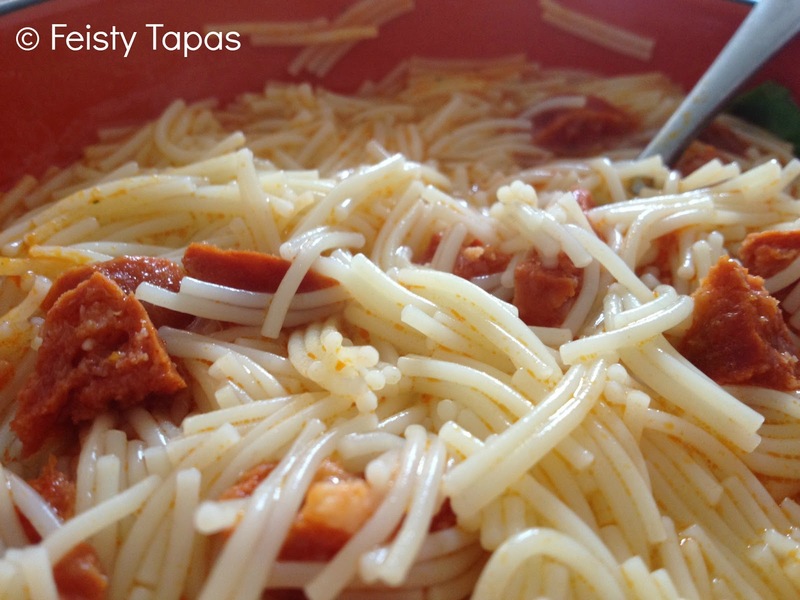 Serve with Spanish flair and by grating parmesan on top. ¡A la mesa! 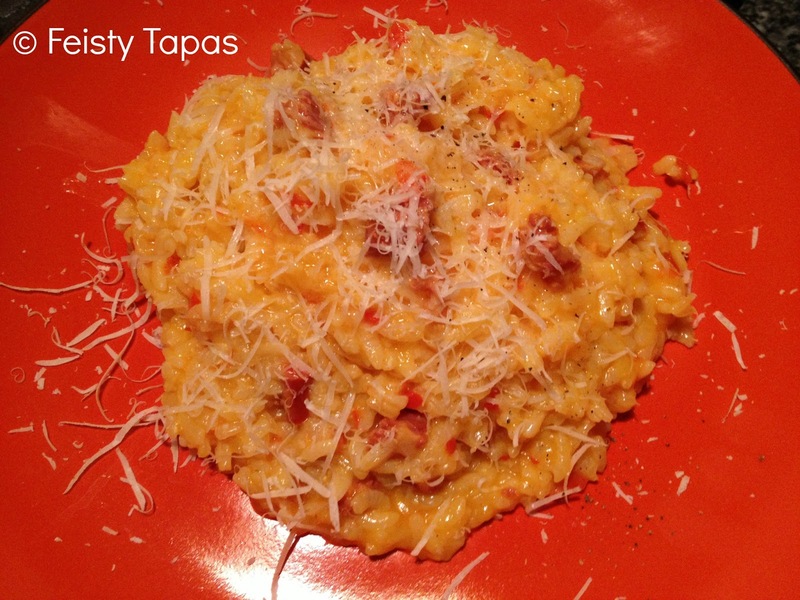 I first discovered this Chorizo and red pepper risotto recipe this time last year, I had never cooked risotto in my life and chorizo seemed the right place to start. It’s (Mostly) Yummy Mummy‘s recipe and, as you can see in the comments on her post I first tried it in February this year. Well, I can tell you I have cooked it a fair few times ever since then and it is one dish that my husband loves. What I like the most about this recipe is that these are ingredients that we tend to always have at home, meaning that I can prepare a delicious dish that we all love when I have no idea what else to cook. Sarah aka (Mostly) Yummy Mummy is a lovely lady with a fantastic blog (make sure you check it out), I have also met her offline and can tell you she is just as lovely as she writes. A lot shier than I had imagined she would be, then again she probably wasn’t expecting this Spaniard to be so excited to meet her. I have tweaked the recipe a bit to suit our taste over time so you may want to take a look at Sarah’s original recipe too. For those of you who are Thermomix users, you can find the Thermomix version here. 100 g chorizo (I use 2 sausages of Tesco’s cooking chorizo). I quarter it lengthways first and then slice it, it makes the most of the chorizo, reducing how much of it you have to use and giving the dish lots of flavour. Thriftier and healthier in one go. 1 chopping board for vegetables, 1 chopping board for meat and a large pan, 1 ladle, 1 wooden spoon. Gently fry the onion, garlic and red pepper until soft in olive oil in a large pan until soft. Add the chorizo to the pan and fry gently stirring every once in a while for the oils to be released. Next add the rice, stirring continuously for a couple of minutes to mix well and coat it in the chorizo oils. Try not to let it stick but it’s not the end of the world if it does (there are no Michelin stars being awarded today so don’t panic!). of stock it should be cooked, with a lovely creamy yet firm texture. Stir in the herbs, if you’re using them (it works well without them too) and add salt and pepper to taste. Try it before adding the salt though as it’s often the case that, thanks to the chorizo and the stock, this dish has plenty of flavour. Serve with Spanish flair and freshly grated parmesan and a twist of the pepper mill. Tip: Next time try adding a splash (an a half) of red wine when you’re frying the chorizo, it gives it an irresistible depth of flavour and, since you had to open the bottle, you can drink a glass of vino tinto with your dinner. 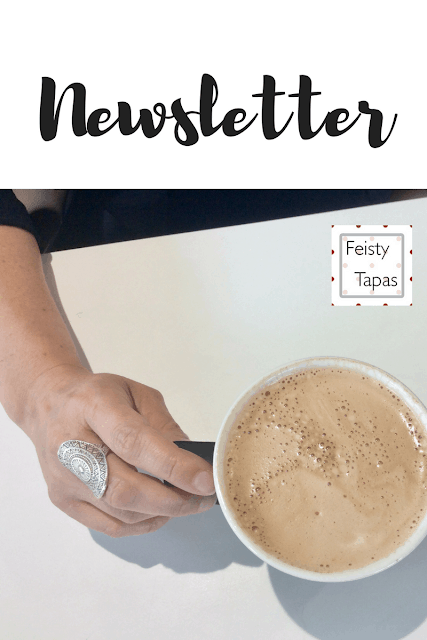 If you’re new to the Feisty Tapas blog (¡hola!) and would like to find out more about me, come this way.